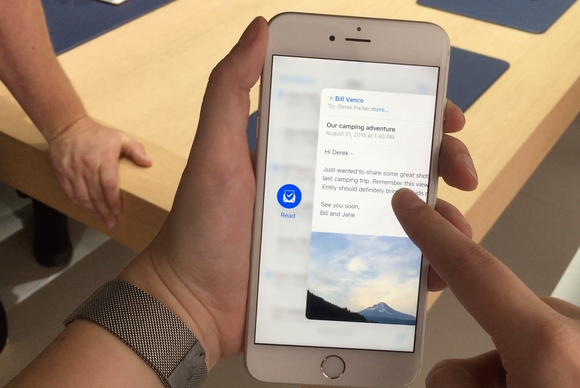 When it's hard to tell a button from a link, the iPhone 6s and its 3D Touch feature could put more power into the hands of the visually and motor impaired. Imagine, for example, iOS 10 or 11. Apple will almost assuredly bring Force Touch to the iPhone and iPad, and they could utilize the technology in a slew of ways. They could effectively solve the problem with buttons in iOS 7 and 8 by using haptic feedback to denote a “button press” everywhere in the system. Thus, visually impaired users like me wouldn’t have to struggle so much in figuring out what’s a button versus a text label. Likewise, Force Touch could save those with motor challenges from the work of extra taps by allowing force-pressing to bring up contextually specific controls. There are lots of possibilities here. My assumption that it would take two or three years for Apple to bring Force Touch to an iOS device was silly in hindsight. That’s because Apple is bringing Force Touch—namely, “3D Touch”—to the new iPhone 6S and 6S Plus, announced last Wednesday. Apple is calling 3D Touch the “next generation of Multi-Touch,” with Peek and Pop and Quick Actions. My first impression is that the new technologies look pretty cool. From an accessibility perspective, there are some obvious benefits that jump out at me, but so too are there potential downsides. Force Touch is useful simply as a time- and energy-saver. In visual terms, scanning a user interface can be daunting because it can be hard to find a certain button or icon. This is especially true in apps with busy or cluttered UIs [like Apple Music](http://www.macworld.com/article/2953973/ios-apps/apple-music-in-ios-9-gets-a-much-needed-redesign.html). Too much scanning is problematic in another way: it causes frustration, as well as eye strain and fatigue. Similarly, some users with fine-motor delays may feel frustration and/or even literal pain by having to tap a bunch of buttons to, say, send an iMessage or email. Quick Actions streamlines the process of calling your most frequent contacts. 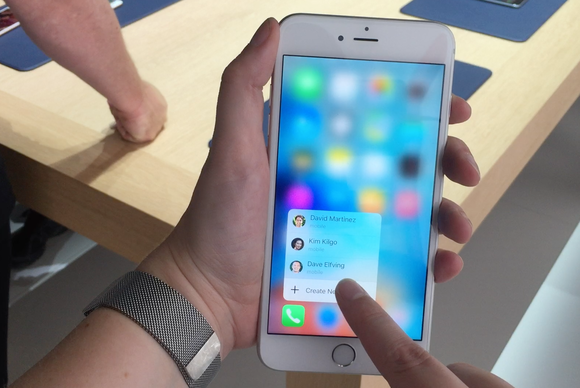 Enter 3D Touch’s Quick Actions. What this feature allows is quick scanning and fewer taps. For example, instead of having to launch the Phone app, find the right tab, find a name, and tap it, someone like me can just hard-press the Phone icon on the Home screen, and tap a person’s name to call them instantly. It seems trivial, but the few seconds that are shaved off by Quick Actions really does have the potential to make a significant difference for the motor impaired. It makes a laborious task much more accessible. As for Peek and Pop—which lets you preview things like emails and location maps by hard-pressing them, then hard-pressing again to open them fully—it seems like more of a convenience than anything else. I’m having trouble figuring out what its accessibility benefit would be. That isn’t to say that there aren’t any accessibility wins here—I’ll just have to try it in person to see. First, complexity. It’s not hard to imagine someone who’s cognitively delayed or has a learning disability being confused by 3D Touch’s layers and functions. Forgetting or misremembering what each touch does and how to get to them can lead to a less-than-enjoyable experience. It’s a bit of a tightrope walk, though: you want people to use 3D Touch, but the pragmatic approach would be to keep the UI mechanics as simple as possible by eschewing 3D Touch altogether. Simple may be best in these cases, but then you miss out on a marquee feature. It’s not an easy choice. The Peek and Pop maneuvers could come in handy when you're looking for a specific email in a list of search results. From a visual and motor standpoint, I have questions about Quick Actions and Peek and Pop. Will Quick Actions’s menus respond to Accessibility features such as Large Dynamic Type and VoiceOver? The same goes for Peek and Pop. My gut tells me that Apple’s considered these things and has added Accessibility support, but I can’t be 100 percent sure until I get my hands on an iPhone 6s. If it seems like I’m writing mostly conjecture, that’s because I can’t definitely speak to 3D Touch’s utility as an accessibility tool—after all, the new iPhones aren’t out yet. The true test, of course, will come when I can play with one. Still, as a person with both low vision and motor delays, I’m bullish overall about 3D Touch’s usefulness to me. If anything, I think it’ll make me more efficient, but that efficiency will only be as high as 3D Touch is accessible.